Product was amazing, turnaround time from order to receiving was phenomenal. Unmatched service. Outshines any competitor in its field. Would and will be purchasing more items in the future as the need arises. 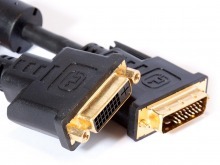 DVI Extension Cable products for the best quality AV Accessories at the lowest prices every day! Did you know Cable Chick also have Micro HDMI Cables?